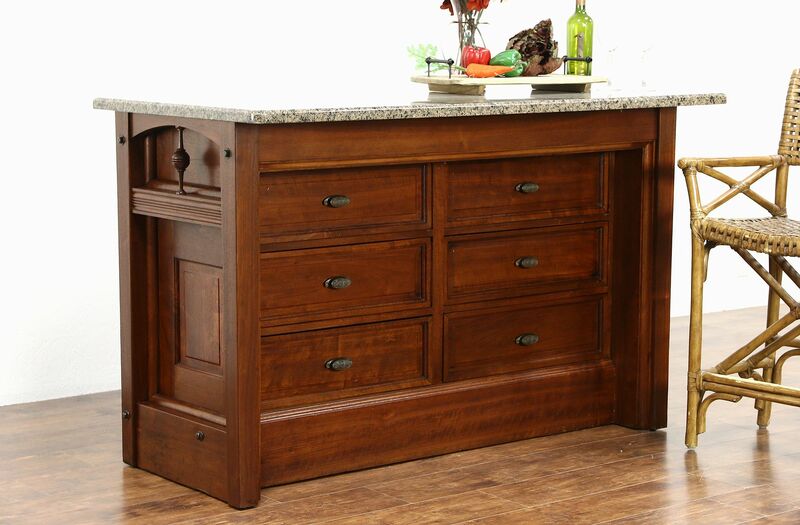 A kitchen island or counter from the 1890's has a new 1 1/4" thick granite top. Walnut and cherry, the restored finish is in excellent condition on this American made antique furniture. There are small losses at the bottom edges, see photos. Six large drawers have antique cast iron pulls. The granite can be moved forward or backward, so the overhang for stools can be on either side. Ends have raised panels and spindles. Giant iron bolts secure this counter together. Size is 61" long, 30" deep and 38" tall.